Our Snow Cone Machine "The Snow Bank" ice shaver is TOP OF THE LINE, made in the USA by Benchmark USA Inc. and will produce up to 500 pounds of crushed ice per hour. The blades of the cutting head are pre-set to produce standard coarse snow cone ice or it can be adjusted to produce finely shaved ice. Rotating at 1700 rpm?s the heavy duty 1/3 hp motor is designed for years of durable service. 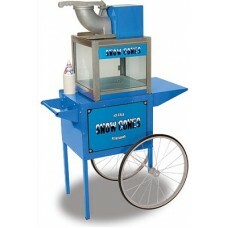 This simple to use machine features tinted tempered glass panels, die-cast aluminum horn, cutting head and pusher, adjustable stainless steel cutting blades, Safety Re-set Button, Snow Cone Shaper, polycarbonate service door and a molded plastic drainage deck. Features a heavy duty 1/3 hp motor, safety reset button to prevent accidental start-up, adjustable cutting blades from fine to coarse, built-in Snow Cone shaper for perfect snow cones every time and a 3 year warranty.